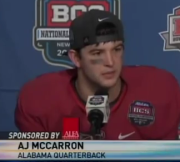 Despite throw two touchdown passes in Bama's victory Saturday night, Tide quarterback AJ McCarron thought he and the offense could have done better. Although the offense produced a lot of yardage and points Saturday night, McCarron thought the offense fell off a little bit in the second half. He also admitted to nit picking his own performance as well. To read more on what AJ has to say, check out this link on AL.com.